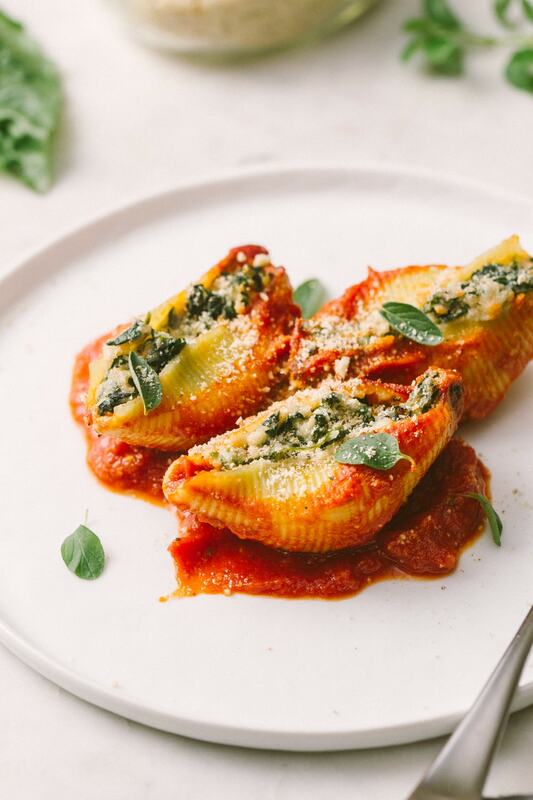 Vegan stuffed shells are made with simple vegan cashew ricotta, spinach, and flavorful pasta sauce, it’s both heavenly and comforting! 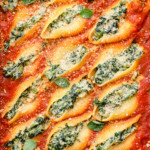 This Spinach-Ricotta Stuffed Shells recipe is easy to put together and will be on the table in about 40 minutes. Stuffed Shells are perfect for making ahead and freezer friendly, making them a great recipe to prep and stock in the freezer for later. It’s a winning medley of pasta, cheese, and your favorite pasta sauce. 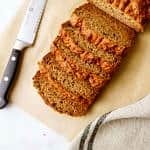 Don’t forget a slice of brad to get every last bit of pasta sauce, this No Knead Bread is perfect! If you love comforting Italian pasta dishes, you must try this Ultimate Vegetable Vegan Lasagna, or maybe this Simple Cheese Manicotti, both use the homemade cashew ricotta called for in this recipe. This stuffed shells recipe is yet another classic Italian dish made vegan! Jumbo Shells: Source out large jumbo shells, cook according to package directions. The shells were super easy to fill, using a spoon, with none of them falling apart or breaking. Cashew Ricotta: Making your own homemade vegan cashew ricotta is super easy, and only takes 10 minutes. You can make it ahead of time, storing it in the refrigerator for up to 5 days before using. But freshly made cashew ricotta is the best! Spinach: Use fresh or frozen spinach. Both work well, so use whatever you prefer or is more convenient. If using fresh, simply steam the spinach until wilted, give a good chop to cut it up. Frozen spinach should be thawed and squeezed to remove excess water (you can do this right in the package by cutting the corner, and squeezing the bag. Pasta Sauce: Use your favorite pasta sauce. Right now, I’m in love with this sugar-free roasted garlic pasta sauce from Muir Glen. Final Touches: Finish it off with a little fresh basil or oregano for a pop of color and another layer of flavor. A good dusting of Almond Parmesan is also a perfect garnish for these stuffed shells. Cook the pasta shells according to the package directions. 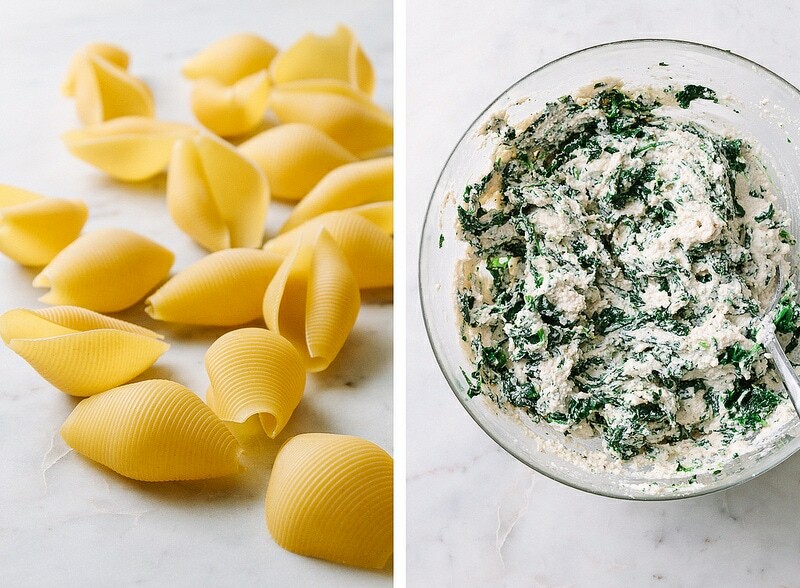 While the pasta is cooking, mix the ricotta with the spinach. Add the whole jar of pasta sauce to the bottom of a 9 x 13 baking dish, an oval or round baking dish is fine too, make sure it is evenly spread. When pasta is ready, drain well, and using a spoon scoop out rounded tablespoons of ricotta mixture and stuff each pasta shell, placing it into the baking dish (shown above). I was able to get 3 rows of 6, your results will vary depending on the size of your baking dish. Bake, covered, for 15 minutes, sauce should be nice and bubbly, remove cover and bake for 10 – 15 minutes more. Remove, let set a few minutes, sprinkle with almond parmesan and herbs (shown below). 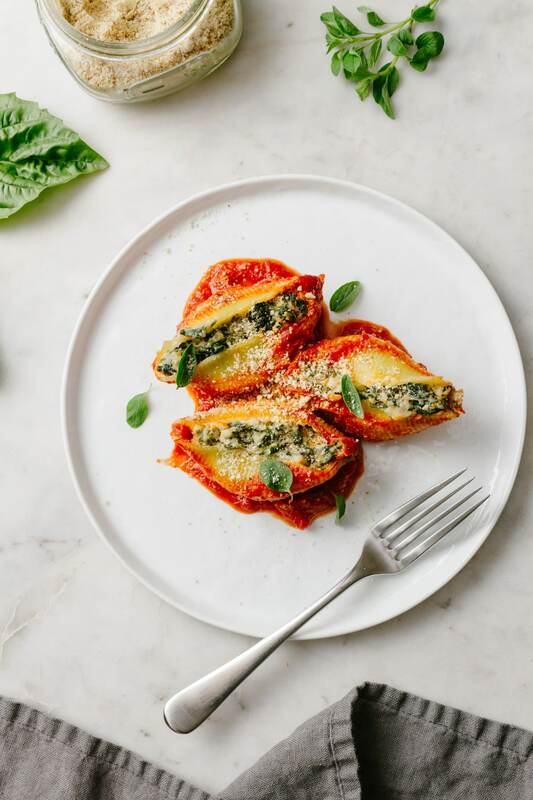 That’s it, spinach-ricotta vegan stuffed shells is a fantastic family style dish the whole family will love! Can You Freeze Stuffed Shells Before Baking? Yes! 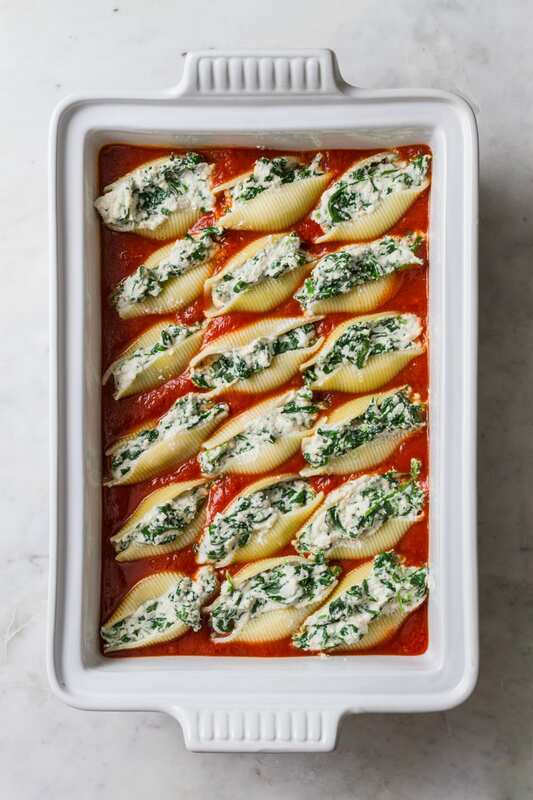 Simply prepare the stuffed shells according to the recipe up until baking, store in a freezer safe container, or cover tightly with cling wrap and foil, and keep in the freezer for up to 3 months. Bake as directed adding and extra 5 – 10 minutes at each temperature called for in the recipe. How Long Can You Keep Stuffed Shells In The Refrigerator? 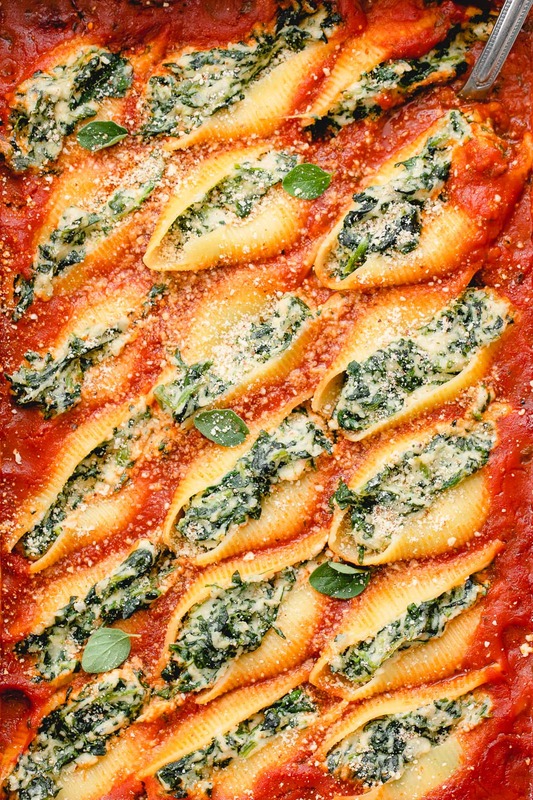 Make ahead: When making ahead, vegan stuffed shells can be filled and kept, covered, in the refrigerator for up to 24 hours in advance. When ready to bake, simply place in the oven and bake as usual. Cooked: Cooked, or leftover, stuffed pasta shells can be stored in the refrigerator, in an air-tight container, for up to 5 days. How Do You Re-Heat Stuffed Shells? Reheat leftover stuffed pasta shells by putting them into a shallow oven save dish, cover, and bake at 350 degrees F. until heated through, about 15 minutes. Remove cover and serve. 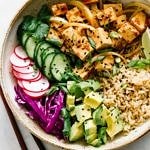 You can never have too many comfort dishes to turn too, try these other delicious vegan pasta dishes that will comfort your soul and make you feel at home. 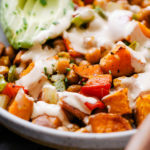 You may just find a new favorite recipe for the meal rotation! 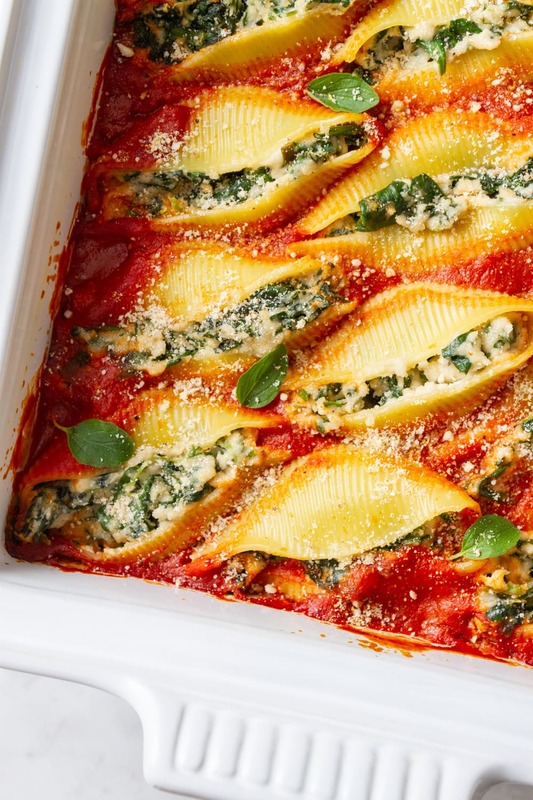 If you try this vegan stuffed shells recipe, please let us know! Leave a comment and rate it below. 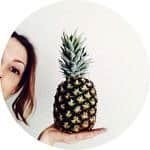 I love to hear what you think, or any changes you make. 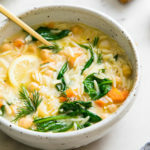 Made with simple vegan cashew ricotta, spinach, and flavorful pasta sauce, it’s both heavenly and comforting! Easy recipe and ready in 40 minutes. Pasta: Cook pasta shells according to package directions. Ricotta Stuffing: Combine the cashew ricotta with the spinach, set aside. Prep the baking dish: Pour the entire jar of pasta sauce into the bottom of a 9 x 13 inch baking dish, spreading evenly to all edges. Alternately, pour half the pasta sauce, fill with stuffed shells, and pour the other half over top. Bake: Place baking dish, covered, in the center of the oven for 15 minutes, sauce should be bubbly. Remove cover, reduce heat to 375 degrees F. and cook for 10 – 15 minutes more. Serve with fresh chopped herbs of choice and a good dusting of almond parmesan. Store: Cooked, or leftover, stuffed pasta shells can be stored in the refrigerator, in an air-tight container, for up to 5 days. Make ahead: When making ahead, stuffed shells can be filled and kept, covered, in the refrigerator for up to 24 hours in advance. When ready to bake, simply place in the oven and bake as usual. If you’d like to add a layer of vegan cheese over top before baking, I recommend using Myoko’s Vegan Mozzerella. It melts great and tastes fantastic for a vegan cheese! I love and recommend using this Le Creuset baking dish (<< affiliate link) with lid when making these stuffed shells or lasagna.